If you have such a hot summer as I do here (around 45C), you need a good refreshing cocktail to cool you off on a weekend. What about Sangria? It is a type of punch from Spain and Portugal, which is served during summer and in some parts of the countries year-round. 😀 Sangria is made from wine, fresh chopped fruit and sweetener, with an occasional addition of brandy (or vodka, rum, soda may be added). Sangria is named after the word ‘bleeding’ for its bold red color. Now it’s very popular party drink around the world. 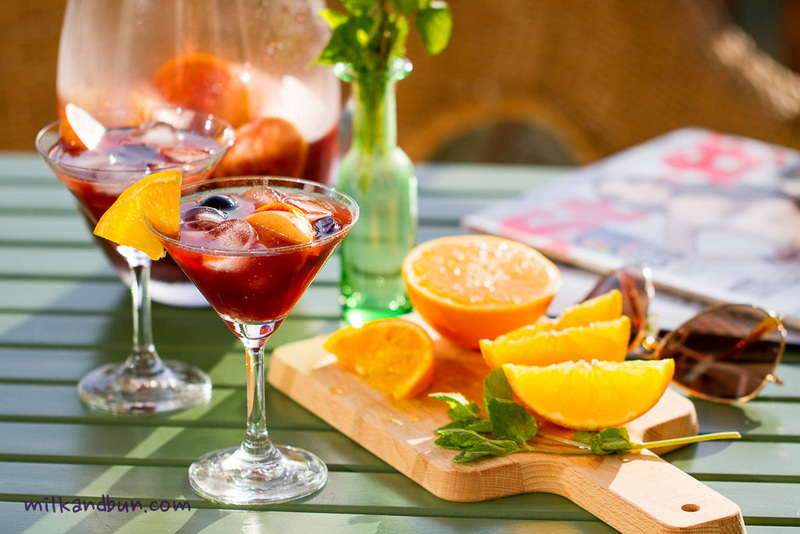 A classic sangria of red wine and fresh fruits that’s easy to make ahead of time for outdoor gatherings. In a small saucepan, mix water, sugar and spices. Bring to boil and simmer the syrup over medium heat for 5 minutes or until the sugar is dissolved. Cool completely. Such syrup is called simple syrup. Cut orange, lemon and apples into wedges; cut some grapes into halves. In a large pitcher, combine the wine, brandy, juice and simple syrup. Add all of the fruit and stir to combine. Cover and refrigerate until chilled and all the flavours are melded, about 2-3 hours, or better overnight. When sangria is ready, add some ice into the pitcher and stir to combine. Serve over ice in a cocktail or wine glass; garnish with some of the soaked fruit and orange wheels. You can top with the desired amount of orange juice or sparkling water, if using. Jul12July 12, 2014 • By milkandbun • This entry was posted in Drinks and tagged blog, Blogging, cocktail, drink, food and recipes, food photography, food styling, fruits, photo, photography, recipe, recipes, red wine, Sangria, Spanish, summer drink. Bookmark the permalink. That is a beautiful sangria recipe. I have never tried mixing the spices when preparing the simple syrup, but from now on that is what I’ll do. Sangria, especially a good one, is always a hit at a party, so thanks for bringing it along. I’m sure the other guests will enjoy it as much as I do. Gorgeous sangria and exactly what we need at the party, I’l have seconds! Thank you, dear Suzanne! You are always very kind! love sangria, but have never made as seems a lot of work. You’ve done quite nicely 🙂 Gorgeous photos, too. I never had sangria until my daughter lived in spain for a summer. Then she made it for me. She’s still better at it than I am. Love your photos!!! Could use one right now!! Oh, you are such a sweet person! 🙂 Thanks a lot, Serena! And about the weather- yes, it is very hot! And it’s always been the normal temperature for summer, sometimes it rises up to 50C! Thank you so much, Selma! It’s such a pleasure to read such a lovely comment from you! Thank God, we do have AC here everywhere, otherwise I hardly imagine what could be..
It’s time to serve lots of drink at the FF party, and I will endlessly refill my glass. Yay!!!!! Thank you, dear Pang! 🙂 Have a nice weekend! This sangria looks utterly perfect! Love sangria! This looks great. Summery drink 🙂 Thanks for the comment! haven’t had sangria in forever – will have to make this when summer arrives here in Sydney. It is a perfect cocktail for summer days! 🙂 Thanks for visiting!